In my research while looking for signs in the Sun, the Moon and the Stars using StarryNight software I came across something very interesting, I heard the Holy Spirit say "follow the moon". Now this probably does not make much sense to you but it did to me. When using this software you can centre (center) on a particular body, such as the moon, the sun, or any planet or star you wish, then you can watch what happens as time is sped either forward or in reverse. That is how I located what I am about to reveal. The moon revolves arround the Earth every 29.4 days (12 times each year). It takes Saturn 29.4 earth years to complete one rotation around the Sun. Now it's no big deal that the moon's conjunction with the planet Saturn each time the moon circles the earth, but what is significant is the dates that it falls on when that conjuction occurs. This year, 2 days before Passover April 7 2009 this occured. It also accured exactly on Pentacost 5/31/2009. It will again happen on just prior to Rosh Hoshanah, September 18th 2009 as you have already seen. This is an important one. I went back to check the date of May 15, 1948, the day Israel became a Nation, the Moon and Saturn were in conjunction on that very same day. The Moon circles the Earth every 29.43 days at a speed of about one kilometer per second (2,300 mph). The average distance from the Moon to the Earth is 384,401 kilometers (238,857 mi). The moon has a slightly elliptical orbit, approximately 356,000 kilometers (221,600 miles) distant at perigee and 406,997 kilometers (252,950 miles) at apogee. Saturn revolves or orbits around the sun once every 29.4 Earth years, or once every 10,755.7 Earth days. Saturn travels at an average speed of 21,637 miles per hour or 34,821 kilometers per hour in its orbit around the sun. The average orbital distance of Saturn from the Sun (its semi-major axial radius) is 1,433,449,370 km or 890.7 million miles. Mercury completes one orbit of the sun every 88 days. Average Orbital Speed of Mercury is 47.8km/s. Mercury's orbit is severely elliptical meaning that the planet's distance to the Sun varies. At its closest, Mercury is 46 million kilometers (28.5 million miles or 0.31 AU) from the Sun, and at its farthest it is nearly 70 million kilometers (43 million miles or 0.46 AU) from the Sun. The mean distance is 58 million kilometers (36 million miles). COMETS - 2009 is a fairly good year with three comets likely to come within binocular range. There are several other comets that should be within visual range for larger telescopes and many more for the CCD observers. 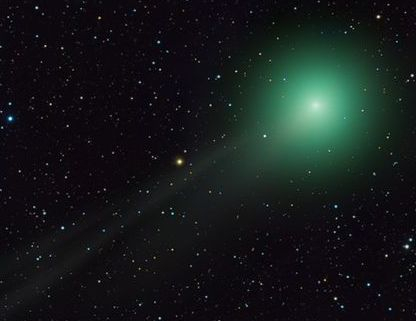 In 2010 several comets will be visible. The highlight is the return of 103P/Hartley, which makes a close approach to the Earth and could reach naked eye brightness. 81P/Wild should become visible in binoculars at around 9th magnitude, whilst 2P/Encke reaches 4th magnitude as it passes through the SOHO or STEREO fields. Celestial Events corresponding to history and the Bulls-eye Blood Moon. - Some of them are central lunar eclipses, like hitting the bulls-eye of a dartboard. - Some of them are visible from certain areas of the earth i.e. Jerusalem. - Some of them correspond with Jewish Holidays described in the Bible. For example, there are three Tetrads falling within a current 66 year period that all occur on Jewish holidays. This is the last such sequence for over three hundred years. There have been 33 central bulls-eye lunar eclipses in the past century, 18 of them fall on Jewish holidays, 6 on high holidays and only one is within a Jewish Tetrad. That one is Passover, Apr 13 1949 which is also the first eclipse of the Jewish Tetrad coincident with the beginning of the Jewish Nation of Israel. The last Jewish Tetrad happens to be bracketed perfectly by two central lunar eclipses which naturally define both a seven year period according to Daniel 9 and a seventy year period according to Luke 21:32, and Psalms 90:10. And as a final note ALL of the eclipses that fall on high holidays, happen to be visible from Jerusalem. May 15th 1948: The State of Israel is declared beginning a war with six Arab armies. April 3rd July 20th 1949: The armistice is signed, Israel doubles their landmass. 7 June 1967: Jerusalem captured in the six day war. 2011 June 15th, central lunar eclipse, Bulls-eye Blood Moon, directly in line with Jerusalem. The US, PA, UN, EU, Arab league, and Vatican have ALL declared support for a two-state solution to The Palestinian Problem, with the declaration of statehood defined by the pre-1967 borders, this is expected to happen by August 2011. The last two Jewish Tetrads marked significant events concerning Israel. Will the last one define the final seven year period before Messiah returns? If so it was written in the heavens at creation and in the Bible for over two thousand years. I am not saying anything will happen, what I am saying is you wont have too long to wait to find out, watch for yourself. Six Day War, Jerusalem Liberated!! The next 18 lunar eclipses beginning June 2011 also contain just such a pattern at the very center. · There are three distinct groupings each one overlapping the next by a month. · There are 10 total lunar eclipses in the next 12 years. · There are only two rare central lunar eclipses during the next 12 years. · These two eclipses both occur directly in line with Jerusalem. the difference allowing for the timing of the eclipses is three days. Sets of eclipses repeat approximately every 177 days and 4 hours at alternating nodes of the moon's orbit. ** Calendar adjusted using the Karite method of noticing the new moon nearest the vernal equinox as 1 Abib. And then considering the major event closest to the central eclipse of 13 April 1949 was the UN recognition of the State of Israel less than a month later. It again leads to the start date of the eclipse sequence!!! Geminids Meteor Shower are pieces of debris from a extinct COMET 3200 Phaethon. From what I can tell is that Earth is moving straight into the path of the debris field beginning Dec 6th 2009 thru Dec 17th and peaking Dec 13 & 14, 2009. Geminids are pieces of debris from a strange object called 3200 Phaethon. Long thought to be an asteroid, Phaethon is now classified as an extinct comet. It is, basically, the rocky skeleton of a comet that lost its ice after too many close encounters with the sun. Earth runs into a stream of debris from 3200 Phaethon every year in mid-December, causing meteors to fly from the constellation Gemini. According to Cooke, Phaethon probably looked much like other comets many centuries ago, with a fuzzy head and a glowing dusty tail. But this one was doomed to rapid extinction by its short-period sungrazing orbit. Every one and a half years Phaethon plunges sunward from the asteroid belt and swings by the Sun at a distance of 0.14 astronomical units -- closer even than the planet Mercury. Such near encounters with the Sun would have cooked Phaethon, vaporizing its ices and leaving behind a shell of asteroid-like dust and rock. The story of the legendary character Phaethon is a favorite in Greek mythology. It is a tale of a young man who is driven to prove himself, regardless of the consequences. And for this reason, Phaethon's legend is still meaningful to us even today. According to myth, Phaethon was the son of Helios, the god of the Sun, and Clymene. It was not until Phaethon reached a certain age, however, that he learned that his father was indeed the Sun-god. When he realized who - and what - his father was, Phaethon decided to meet Helios. He therefore went on a journey to the East, where he found his father's grand palace. Phaethon was exuberant. He father was an important and influential god, and the boy was no doubt awed by the power that Helios wielded. So Phaethon did something rash - he asked his father for a favor. Helios, thrilled at meeting his young son, immediately agreed, without even knowing what the boy would ask. However, this fatherly attempt at affection was to have unfortunate consequences. For Phaethon wanted to drive the Sun-god's chariot across the sky. Knowing the folly of the request, but unable to take back his gift, Helios was forced to comply. So the young man joyfully leapt into the chariot. As soon as Phaethon took hold of the reins, however, it was clear that he could not control the powerful horses. Indeed, the immortal horses were much too strong for Phaethon, and they dragged both the chariot and the boy across the sky, causing destruction wherever they went. When the chariot got too close to the earth, the very ground was burned. The sabbatical year 5775 starts on 9/25/14 and runs to 9/13/15. Obviously some of the eclipses are before and after the sabbatical year; the first and last total lunar eclipses are outside of and bookend the sabbatical year. I have never stated all the eclipses were in the sabbatical year. I also never said there was a blood red moon that was part of a tetrad in 1948. I said it was in 1949 and 1950. In regards to whether or not the eclipses were viewable in Israel, we have to realize the signs are for the nations, all of them. Maybe having them seen in different parts of the world is so that no one is left with an excuse. Im sure if they were only seen in Israel someone would say then it doesnt pertain to the nations! Lu 21:24-28 And they shall fall by the edge of the sword, and shall be led away captive into all nations: and Jerusalem shall be trodden down of the Gentiles, until the times of the Gentiles be fulfilled. And there shall be signs in the sun, and in the moon, and in the stars; and upon the earth distress of nations, with perplexity; the sea and the waves roaring; Men's hearts failing them for fear, and for looking after those things which are coming on the earth: for the powers of heaven shall be shaken. And then shall they see the Son of man coming in a cloud with power and great glory. And when these things begin to come to pass, thenlook up, and lift up your heads; for your redemption draweth nigh. Regarding knowing "the day or the hour" scenario. I do not set dates and will not set dates. Closely looking at a span of roughly 530 days is not date setting. First I would like to ask, what do you think this verse refers to in the many events that will unfold during the tribulation? Does it refer to the day the tribulation begins, or when the antichrist is revealed or when Messiah's feet land on the Mt of Olives, or the rapture and on and on? Does this verse require us to put blinders on? I do know that the biblical holidays are the exact days when certain events have happened (the Passover lamb, Messiah is the First Fruits, Shavuot or Feast of Weeks is Pentecost) and will happen; but through every year's cycle of feasts, we don't know if it is a rehearsal or if it will be the real thing. Why would he give us this forewarning that "there shall be signs in the sun, and in the moon, and in the stars" if we are not supposed to study it and know? If we don't know the biblical calendar then we will remain clueless as to what God is doing. Get my feast dvd's to understand what each fall feast was a rehearsal for! After viewing the Star of Bethlehem, (videos have now been taken down from youtube due to copyright restrictions). I was totally amazed at what Fred Larson has found. At the same time still I wanted to verify and see for myself what Frederick Larson (http://bethlehemstar.net) had discovered. I downloaded Stellarium (Astronomy software from Stellarium.com - free download). What he had found I can now verify. God Himself had written the events of the Birth of Christ and the Cruxifiction in the Stars. You can also download the software and see it for youself. 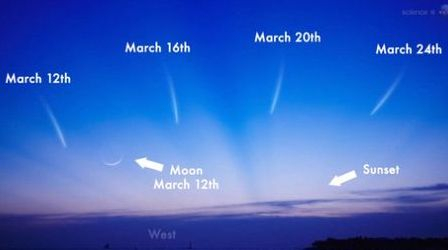 Then on April 5th I felt the Holy Spirit prompting me to search for astronomical events during Rosh Hashanah 2009. I did just that and what I found was amazing! On Sept 18th 2009 just a little after 8:00 PM Jerusalem Time during the transition of the New Moon there is an alignment of the Earth, Moon, Mercury, the Sun, and Saturn in the constellation of Virgo. This graphic depicts the alignment. This event could be of major significance for Israel and the Body of Christ. I have purchased the Starry Night Software to verify what I have found below using the Stellarium software and the update I promised is below. Here is a screen print of the alignment that is showing up in Stellarium. Saturn - top left above the Sun, Mercury just under the Sun (its a little hard to see but it shows up as a dim blue circle, Moon is the white dot below and overlaping Mercury. The labels are overlaped in the software for Moon and Mercury. Wonder where the Earth is? You are on the earth looking at the Sun. It is daylight over the evening horizon because the Sun has just set in Israel. The reason the sky is dark instead of blue is because I have the software set in dark mode which deletes the blue sky and allows you to see the alignment. This image taken at 11:33pm Jerusalem Time, Sept 18th 2009 using Starry Night software. This I believe is a small sign compared to what the Lord is about to do. We will soon witness signs and wonders in the heavens beyond anything we can imagine. Yes, scientist and astronomers can project lunar and solar activity, the movement of planets, comets, astroids, and even galaxies, but what is about to transpire will not be the norm by no means. Be forwarned and do not fear for these things must come to pass. This is very large with an alternating spiral to elliptical shape, obscured by dense cloudy dust and looks strangely familiar. What is it? The NGC 7049 galaxy, dubbed Crown of Thorns because of its eerily look-a-like to the crown of thorns pushed down on the head of Jesus of Nazareth 2000 years ago. The Crown of Thorns is located in the southern constellation known as Indus and is one of the brighter cluster of galaxies (BCGs) so far photographed by Hubble. Composed of uncounted stars, space dust and debris, it is quite an amazing and beautiful site. These type of BSGs are normally much older and quite large compared to their younger brethren, such as our own Milky Way Galaxy, which is a baby in age by comparison. (ABOVE) The first discovery is high-energy X-rays emanating from a nebula. It looks like a big blue out-stretched hand reaching for a red light. The red light is a near by gas cloud. Red represents low-energy X-rays, the medium range is green, and the most energetic ones are colored blue. The blue hand-like structure was created by energy emanating from the nebula around they dying star PSR B1509-58. The red areas are from a neighboring gas cloud called RCW 89. Credit: NASA/CXC/SAO/P.Slane, et al. Notice that wrist looks like it has been pierced. The Wide Field Camera 3 (WFC3), a new camera aboard NASAs Hubble Space Telescope, snapped this image of the planetary nebula, catalogued as NGC 6302, but more popularly called the Bug Nebula or the Butterfly Nebula. WFC3 was installed by NASA astronauts in May 2009, during the servicing mission to upgrade and repair the 19-year-old Hubble telescope. NGC 6302 lies within our Milky Way galaxy, roughly 3,800 light-years away in the constellation Scorpius. The glowing gas is the stars outer layers, expelled over about 2,200 years. The "butterfly" stretches for more than two light-years, which is about half the distance from the Sun to the nearest star, Alpha Centauri. The central star itself cannot be seen, because it is hidden within a doughnut-shaped ring of dust, which appears as a dark band pinching the nebula in the center. The thick dust belt constricts the stars outflow, creating the classic "bipolar" or hourglass shape displayed by some planetary nebulae. The stars surface temperature is estimated to be about 400,000 degrees Fahrenheit, making it one of the hottest known stars in our galaxy. Spectroscopic observations made with ground-based telescopes show that the gas is roughly 36,000 degrees Fahrenheit, which is unusually hot compared to a typical planetary nebulae. NGC 6302 was imaged on July 27, 2009 with Hubbles Wide Field Camera 3 in ultraviolet and visible light. Filters that isolate emissions from oxygen, helium, hydrogen, nitrogen, and sulfur from the planetary nebula were used to create this composite image. From observations of its position by five different groups, Sonia Keys of the International Astronomical Union's Minor Planet Center initially calculated it orbits the sun every 3.39 years. New observations suggest it travels on a path that ventures within 15 million km of the Earth's orbit.